What is Ping and How to ping your wordpress blog post or articles, by pasting ping list blogger in WordPress. What is Ping? What I understand is, ping is like a server that whenever we make updates, and ping them, they will receive our blog post‘s updates. This mean if you ping your articles, search engines will have better chance to crawl your site faster, and can also increasing your traffics. How do i ping my blog? If you are using wordpress like me, it will be done easily by pasting following lists to Admin dashboard/Settings/Writings/look for “Update Services”. 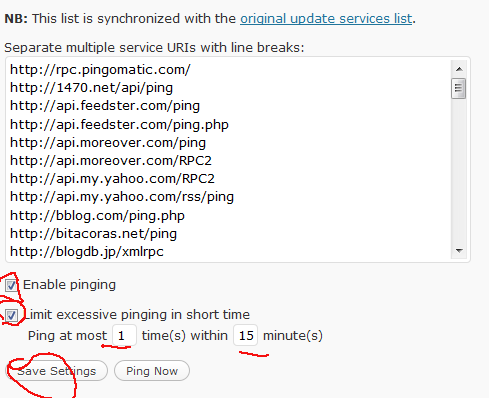 Important NOTE: Do not abuse by pinging your blog too much, it means, this lists will ping every slight updates you make on your post, example, you add one word and update your post, it will automatically ping the ping services, this is NOT good because your blog can be banned from those ping services. To avoid this use “cbnet Ping Optimizer WordPress Plugin” Once you install this plugin, go to settings/cbnet Ping Optimizer and look at the settings, as following image and do not forget to click “save settings”. Download WordPress Ping list for bloggers in a .txt file. pb from Blog web6 on Vimeo. Nice tutorial you did here. I forgot about ping services. I use to use it frequently but like i say i fogot so thanks. Very useful post, really helped me and thanks for mentioning about the plugin to control unnecessary pinging. This is really useful! I use to find manual pinging so tedious especially since I make so many changes. Thanks for this info! I also found this article about what pinging is about really useful I use to have such gray understanding about it. Hope this helps others as well. Hey cheers for this, are you able to publish the list that you refer to because I don’t use WP? If you don’t use wp, i have no idea Big Col 🙁 sorry. However i know you can ping them manually, in the site, like pingoat.